For the past quarter decade, the Loo of the Year Awards (LOTYAs) has honored what the organization calls "away from home" toilets across England, Scotland, Northern Ireland, Wales and the rest of the U.K.. In commemoration of this year's anniversary, the 2012 LOTYAs ceremony will take place at the St. John's Hotel Solihull. Chuckles are scheduled to be provided by funny woman Shappi Khorsandi. While promoted by the British Toilet Association, the LOTYAs are independently organized and have been implemented to "encourage the highest possible standards in all types of 'away from home' or public toilets," according to the organization's website. 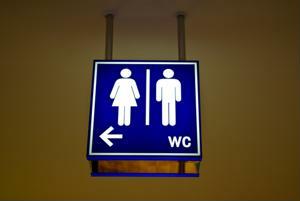 Distinctions are granted to outstanding public restrooms in 58 categories, such as public restrooms in a supermarket, coffee shop, night club, water and theme parks, cinemas and bingo halls. But really, any public bathroom can be nominated - a preexisting category doesn't need to have been established. After a certain bathroom is nominated, a LOTYA official will arrive with no prior warning and judge the facilities on criteria such as decor, hygiene, air quality, security and a handful of other topics. Emphasizing the importance of quality public restrooms, the LOTYA proclaim that the responsibility for making trips to public restrooms optimal experiences falls to us all. "Everyone has a shared responsibility to make this happen," write the organizers. "Toilet providers, managers, washroom suppliers, contractors, staff, visitors and customers - all toilet users." While the official ceremony has yet to take place, a news sources have leaked the identities of some of the winners. A somewhat ironically named pub called the White House at the Thurnby Lodge in Leicester, England received the LOTYA'S platinum rating, according to Northcliffee Media. In addition, the King of Wessex pub in Bathurst, New South Wales received a very respectable gold star rating. "Staff at the pub work hard to ensure the toilets are in first-class condition at all times," manager Robin Smith told the news source. "It is great that this has been recognised by the inspectors." In addition, the Swindon Advertiser notes that a pair of pubs in the Southwest England borough - the Dockle Farmhouse and the Sir Daniel Arms - were both bestowed gold star ranks.